The Ballston Business Improvement District is rolling out BLinked, what it calls the region’s first free, seamless gigabit-capable Wi-Fi network, and it’s not just a series of hot-spots. WASHINGTON — You can get a rock-solid wireless internet connection anyplace outside in Ballston now, thanks to a new network that blankets the entire area. The Ballston Business Improvement District is rolling out BLinked, what it calls the region’s first free, seamless gigabit-capable Wi-Fi network, and it’s not just a series of hot-spots in the Arlington, Virginia, neighborhood. “We have 30 nodes that are spread throughout the district on different buildings, and that creates a whole seamless, wireless mesh around the entire area,” Ballston BID CEO Tina Leone told WTOP. “So, if you’re walking outside, you don’t lose a signal like you’d lose if you walked away from a hot spot. You can actually walk all throughout Ballston or sit in a park and have lunch and use our fast, free Wi-Fi ,” she said. The Ballston BID worked with Rockville, Maryland-based Wi-Fiber to develop its internet ecosystem to serve Ballston’s 30,000-plus daily workforce. It is also a smart network that can adapt to usage. By using algorithms to track data usage patterns throughout the Ballston area, BLinked reads and interprets network activity in real time, and can redistribute its resources to keep up with traffic and usage demand. It also would serve to cut down on cellular network traffic in crisis situations, and serve as a medium for emergency services during heightened cellular traffic. “We’ve had success with this technology on a global scale,” said Chase Donnelly, a founding partner at Wi-Fiber. “We’ve built Internet ecosystems that serve Japan’s bullet trains, British Telecom and downtown Dubai,” he says. The Ballston network has the potential to serve as a sort of spinal cord for infrastructure services. “We could partner with Arlington County to control the traffic signals based on actual traffic patterns that are happening. We could be turning on and off street lights from this network. The connectivity is really limitless in how we could better manage Ballston and maybe in the future all of Arlington County,” Leone said. BLinked is free and works with any smartphone, tablet or laptop. It is finishing up the testing phase right now, and it will be up and running for the public by the end of March. The free Ballston BID app. 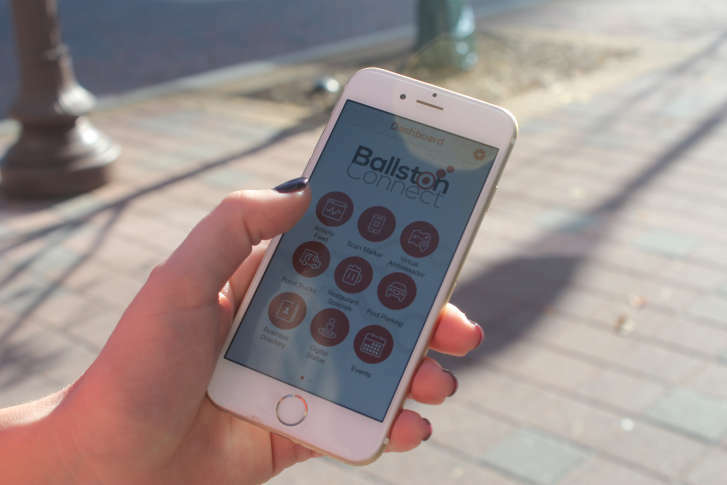 Ballston Connect, already serves up a stream of static and real-time information, including food truck locations, current events and has a business directory.